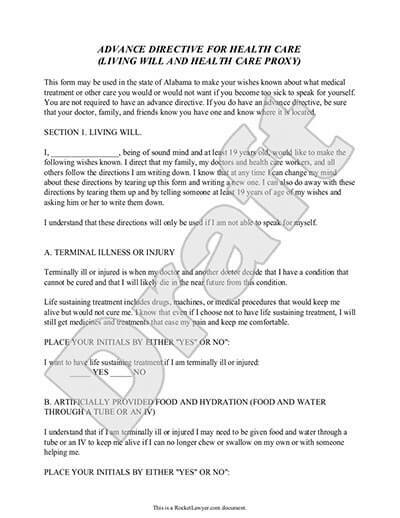 A Living Will document helps you control your medical care. It outlines what medical procedures you approve of to attempt to preserve your life and it provides instructions for your end-of-life care. With this document you can control what happens to you should you not be able to actively voice your preferences for yourself. You want to dictate what life-saving or life-prolonging measures can be applied in an attempt to keep you alive. 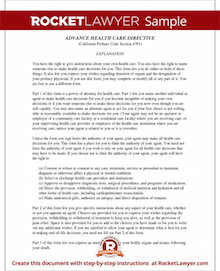 You want to outline your preferred end-of-life medical care treatment. You are scheduled for a high-risk medical procedure or surgery. You have been diagnosed with a terminal condition and or are entering hospice care. It is beneficial for every adult to have a Living Will if they want to dictate what life-saving medical procedures can be performed in an attempt to save their life and what life-ending care and comfort measures they want to be provided. Rocket Lawyer's document builder makes it simple to write your Living Will that includes all the legal provisions required to help you make it legal. A Living Will is a legal document that outlines your preferences in regard to what life-saving measures medical staff and first-responders are allowed to perform on you to save or prolong your life. It also states what end-of-life pain management and comfort measures you want to be administered during the closing phase of your life. In addition, our document includes the option of appointing a healthcare agent to make sure your wishes are implemented. How is a Living Will different from a Will? A Living Will concerns medical decisions whereas a Will (Last Will and Testament) concerns your financial matters. Quite often the person, called an agent, who you put in charge of communicating your medical choices may not be the same person as your Power of Attorney or executor of your Will. Your agent is someone you carefully choose to make your medical choices if you become incapacitated. Do I need a lawyer to write a Living Will? No, you do not need a lawyer to make your Living Will. Depending on the state you live in, you will likely need a witness or two though. For the most part, making a Living Will is simple and many of the forms, including the one we provide, is designed for you to be able to fill it out on your own. Making a Living Will is not difficult, but you will need to make some important decisions to complete the document. Our document builder will generate the legal language for you based on how you answer a few critical questions. If you are in a persistent vegetative state, do you want life-sustaining procedures withheld or withdrawn? Do you want certain conditions to be met before life-prolonging care is withheld or withdrawn? Do you have any unique or special requests? How much does it cost to make a Living Will? Making a Living Will does not have to be costly. Using Rocket Lawyer, making your Living Will is nearly free. In fact, you can use Rocket Lawyer to create all Estate Planning documents. If you create your Living Will with a lawyer outside of the Rocket Lawyer associated attorney pool alongside your other estate planning documents, it may cost a few thousand dollars overall. Does my Living Will need to be notarized? In most states, you do not have to have your Living Will notarized. Of course, you can have it notarized if you feel it may benefit your situation, such as if you do not have a reliable witness. Most states will want you to have one or two witnesses sign your Living Will. State laws vary on who can witness your document. Choosing your agent, the person to carry out your wishes can be challenging. In many cases, your spouse or sibling may have a difficult time making hard life-saving or life-ending medical choices for you, so you may benefit from considering other options. Once you decide on a few candidates, you should discuss with them the responsibilities of being your healthcare agent or proxy. You'll want to thoroughly discuss with your agents what your wishes are and ensure that they understand them. They should also be able to have the fortitude to make sure your wishes are satisfied even if your family members object. Who needs a copy of my Living Will? Your Living Will cannot be enforced if no one knows you have one. The first person who should have a copy of your Living Will is your primary care physician. You should also supply a copy to your lawyer, your spouse if applicable, and a close family member. It would also be prudent to keep a copy alongside your other estate planning documents. What is the difference between a Living Will and Healthcare Power of Attorney (POA)? A Living Will contains specific instructions for your care, whereas a Healthcare Power of Attorney appoints someone to make medical choices for you. Living Wills are concentrated mostly on end-of-life care. Healthcare Power of Attorneys are often appointed to make choices for you if you cannot make choices for yourself such as if a decision needs to be made while you are in surgery. What other state requirements may apply to enforcing my medical wishes? Some states may require that you submit others forms such as a Do-not-resuscitate (DNR) request to your state Department of Health or other government agency if you wish to not receive cardiopulmonary resuscitation (CPR). In many cases, you will need to request a DNR order from your care provider. Your doctor should be able to tell you how to obtain a wallet card, bracelet or document to keep with you in case an incident occurs. Your doctor should make note of your DNR order on your medical chart to inform other medical staff of your wishes should you be hospitalized or in hospice care. If you do not have a DNR order in place, your appointed Healthcare POA agent or legal guardian should be able to submit the order for you. Will my Living Will be enforced if I am pregnant? Our document builder will ask you if you want your Living Will followed if you are pregnant; however, your Living Will could be negated. Some states will not enforce Living Will instructions if you are pregnant. While it is not common to require that a mother be kept alive until she is full-term, it is something to consider thinking about if you are still in your child-bearing years. I've created my Living Will, now what? Making a Living Will is a good start. We provide other documents that are just as simple as this one to make that can help you manage your finances and health if you should become unable to do it yourself. A Power of Attorney allows you to appoint a person to manage your financial and related legal matters should you become incapacitated or otherwise not available to attend to your financial matters. You can make your Power of Attorney assigned to be active when certain triggers are met, such as if you become medically incapacitated or when you are unable to attend to your financial matters such as if you are facing an extended military deployment. A Living Trust allows you to set funds and assets aside to be used immediately if necessary. These funds are available when needed, well before distributions from your Will can occur since Living Trust funds do not have to go through the usual probate process. This is a way you can ensure that your family, business and financial obligations are met even if you are incapacitated or passed on. Your Will outlines how your assets are allocated, who is to be your guardian of your minor children, and how your pets will be cared for, if applicable. You can also use your Will to leave assets to your business partners if required of your partnership agreements. Your Will goes into effect after you pass. It has to go through probate before assets are distributed. Our step-by-step interview process makes creating a printable Living Will easy.